The partner universities implemented their first joint project of teacher training at the turn of the year 2017. The international dimension made the students step outside their comfort zone. As a reward, they gained valuable experience as well as study credits. The strategic partners Häme University of Applied Sciences (HAMK) and Danish VIA University College carried out a joint study project between 3 October 2016 and 20 January 2017. The project involved students from both universities’ teacher training programme, and two teachers from each school were responsible for its planning and implementation. The working language was English. The basic starting point was to create genuine cooperation between the universities involving both the teaching staff and students. As the first joint teacher training project between HAMK and VIA, the project was particularly important and interesting. The aim was to engage the Danish and Finnish teacher training students to collaborate on the questions of learning and evaluation together. The framework consisted of STEM pedagogy (Reeve 2015) and the development of teaching mathematics (Niss & Højgaard 2011). Many Danish students involved in the project were training to become teachers of mathematics, while the Finnish students were studying to become vocational teachers in different technological fields. Also vocational teachers need to know how to integrate mathematical and scientific content into their syllabus (Enqvist 2013). The unifying element of the project was the understanding that mathematics skills are important in today’s society. This issue is continuously emphasised in the world of growing technology and, in particular, when working with different areas of technology. The planning of the study project began in autumn 2015, when the Head of the Degree Programme from each teacher education unit compared each other’s curriculum and implementation plan. The cooperation was facilitated by the fact that both had a competence-based curriculum and a module-format implementation plan. The comparison revealed various mutual areas of knowledge, out of which teacher´s assessment and evaluation competence was chosen for the project, as it is an integral part of learning and competence. VIA hoped that mathematics would provide a context for the project, as one of their focal points is research related to teaching mathematics. This suggestion suited HAMK well because our teacher education had also gained many years of expertise in teaching mathematics in vocational education. In spring 2016, the project teachers and students were selected. In addition, the project’s central operating structures were established, which the teachers in charge then developed into their final form in autumn 2016. Project learning was used as the pedagogical model. The students familiarised themselves with the literature and materials chosen by the teachers. 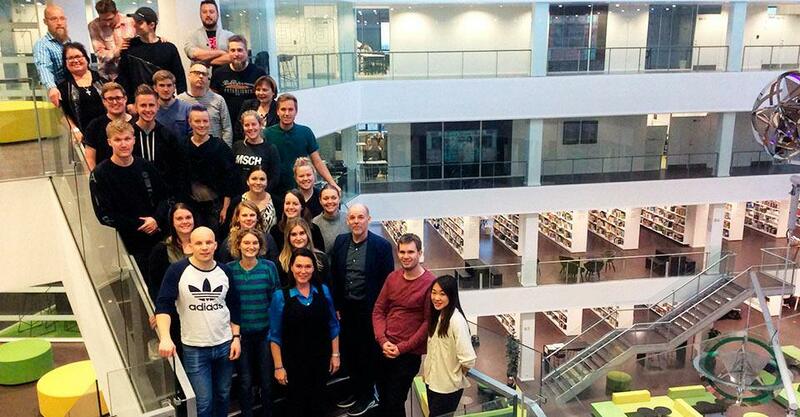 A two-day period of contact learning took place in Aarhus, Denmark, 16–17 November 2016. During this period, the peer groups were formed, each consisting of students from both countries. In addition, the students were familiarised with the theme by the teachers and through working together, and school visits were carried out. The peer groups also began their cooperation, and worked on learning assignments, which continued during the period of distance learning that took place after the contact days in Denmark. During the period of distance learning, which lasted just under two months, the peer groups learned about the educational content and created their own presentations for the final seminar with the help of learning assignments. The peer groups used, for example, Moodle learning platform and different online tools to work on their exercises and to arrange real-time online sessions. The peer groups were instructed during the period of distance learning. 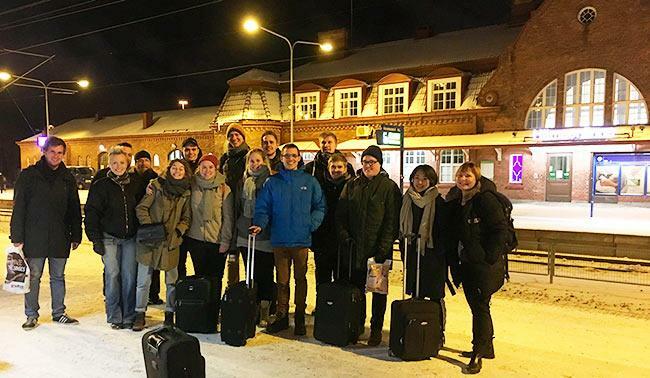 The project concluded with a two-day seminar in Hämeenlinna 18–19 January 2017. Each peer group broadly presented the results of their cooperative development on the project’s themes. During the contact period, there were school visits, and the project results as well as the entire project itself were evaluated in collaboration. Many positive factors arose in the joint assessment of the project. For instance, working in a foreign language offered the students an excellent way to step outside their comfort zone: they exceeded themselves in understanding content as well as communicating in a foreign language. The students’ different cultural and educational backgrounds forced them to work on creating a mutual understanding, which was rewarding. The international approach to the assessment of learning and competence provided the students with a more diverse perspective than what they would have received only with their own student group. School visits in both countries generated new thoughts and ideas, for example, when it became obvious that there were clear functional differences between school cultures in Denmark and Finland. As an anecdote, it could be mentioned how a visit to a vocational institution in Aarhus made the Danish teachers and their students realise that such institutions could provide opportunities to their own teaching. Teachers from both countries said that the planning and working together went well. The planning took place mostly through Skype conversations. Each pair of teachers worked on the chosen theme firstly from the point of view of their own team. This was followed by a Skype session aimed at finding a mutual understanding about the operating structure. Even if the student groups and teacher education programmes were structurally very different, there were no insurmountable difficulties in the planning. Creating a joint study module went surprisingly smoothly. After the first joint study project, we are now wiser than before. We believe we can identify certain critical points affecting the students’ work, especially during the period of distance learning. For example, the students should have been given more time at the beginning to become acquainted with their study group and start working together. The Danish and Finnish students’ differences in thinking should have been better taken into account when delivering the exercises. For this reason, the learning assignments should have been explained in more detail. The starting points of Danish and Finnish students embarking on teacher training are noticeably different. In practice, Danish students start their teacher training directly after upper secondary school, and upon completion, they start working as class and subject teachers. Instead, the Finnish students of teacher training are significantly older, and they already have different degrees. In addition, many of them work as vocational teachers and have a wide variety of work experience. The students’ experiences of the project were positive in many ways. A good example is, for instance, how the students took responsibility and participated with enthusiasm in the programme arrangements for the contact learning days in their own country. All in all, our teacher students felt they had succeeded well in the demanding inter-cultural learning situations. The teachers were satisfied with the successful implementation of the project, the progress of cooperation, and the results achieved. They were particularly happy about the students’ comprehensive commitment to the project. The project also included a so-called hidden curriculum, the aim of which was to obtain valuable international expertise for everyone. Developing the international cooperation further is in itself worth pursuing in teacher education both in HAMK and VIA. Figure 1. The closing seminar was organised in Hämeenlinna 18–19 January 2017. © Katja Rönkkönen. The featured image of the article: School of Professional Teacher Education, Häme University of Applied Sciences. This article was originally published as Yhteistä opettajankoulutusta HAMKissa ja VIAssa in Finnish in March 2017. Jouni Enqvist (Principal Lecturer, PhD) and Katja Rönkkönen (Education Manager, Lic.Sc. (Econ.)) work at the School of Professional Teacher Education in Häme University of Applied Sciences.